Recap: one month after Joker destroyed most of Metropolis and made it so that Superman killed Lois Lane and their unborn child. The city has been uninhabitable, but now a radio message is being heard from somewhere beneath the rubble: "I'm alive." The Justice League, up in the Watchtower, discuss how to proceed. Everyone but Superman is convinced it's a trap, but Superman is determined to take the chance so Wonder Woman and Green Lantern accompany him as back up. When they arrive, Superman with his x-ray vision can't detect anything to be worried about, and they find the radio signal coming from beneath a building. Lifting it up, they find a bunker and Wonder Woman gets the feeling somebody is watching them. Via the communication system, Cyborg counsels Superman that opening the bunker is going to be a mistake, but Superman is determined. He opens the door to find Lex Luthor - Superman's good friend - alone. They rejoice at this "miracle." Meanwhile, Batman confers with a shadowy presence, someone who has infiltrated the Justice League and is feeding information to Batman. The presence tells Batman that a speedster on Lex's payroll got him to safety before ultimately being killed in the nuclear blast, and that Lex has asked to meet with the Justice League. Lex tells the assembled "heroes" that he understands the motivation behind their recent global peace enforcement but says they're going about it in too "heavy handed" a way. He says there aren't enough of them to truly keep the peace and that they need to stop reacting and start planning. Wonder Woman isn't convinced that Lex can be trusted, and he responds by naming them all according to their secret identities. "You've had to trust me for a long time," he says. "You just didn't know it." Now he wants to join them. Story - 3: "Be careful of Diana," Batman tells his unseen collaborator. "She doesn't seem herself." You don't say. I was wondering whether anyone was ever going to comment on her bloodlust. A bit late, though, isn't it? And anyway, there hasn't been so much a hint throughout that she was ever any different. So what's the point of this comment now? Anyway, I have a big problem with the way the telling of this story has fragmented between the game and the comic. The game makes it perfectly clear what's going on - i.e. that we are dealing with two separate dimensions. It's kind of a cheat, but when you put it up front in the narrative, it works. They've kept this out of the comic altogether, though, and now we see Superman and Lex as friends and it's treated as something we're supposed to know. But the only way we can know that is if we are familiar with the game's story. I could punch somebody at DC over this. You know the expression "Too smart for [his] own good"? This is not that. 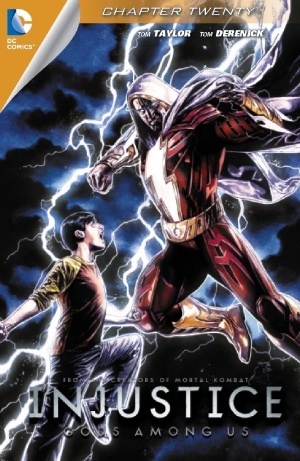 Meanwhile, a clever writer would likely make it so Batman's unseen collaborator is somebody other than Shazam, having ended the last issue on the implied question of whether Shazam will decide to switch loyalties. (The term for this would be "misdirection," fans of Smallville: Season 11's "Detective" episode.) I'm not convinced Taylor is sufficiently clever for this, though, so I'm going to bet that it is Shazam helping Batman. Note that we see him assembled with the Justice League at the end, but not before (in this issue) - a bit of a clue. Or is it? Otherwise, it would appear that we may finally be moving in to the home stretch on this title. Now that Luthor has appeared, it would seem that his discovery of the alternate dimension is imminent, which is where the game picks up. Alas, something also tells me (e.g. solicitations) they're going to drag this out for a while yet, and I just don't have the time left to keep up. Accordingly, I am passing off reviewership duties on this one to T. A. Ewart, who also goes by "liheibao" on the site and who I'm certain has lots more to say about this story than the Homepage's Comments section tends to allow. In parting, though, I'll say this: this story had me at hello but then said good-bye just as quickly. It has now squandered most of its good will, such that where once I was comfortable setting aside my qualms with the more-than-usually-overt commercial impulse of the project, the divergence of fidelity between the two primary mediums in which the broader story is being conveyed has become too much to bear. I flat-out refuse to play the game - not on principle or anything; I just don't like one-/two-dimensional fighting games. Accordingly, I am also probably no longer capable of being impartial about my judgment on the narrative particulars. Thus I bid you, Injustice, good night. Art - 4: Tom Derenick is the best penciller this title has given us, and it shows here. The expressions of surprise when they find Luthor and then when Luthor outs all the heroes' secret identities is a bit overmuch, but on the whole it all works.